Here is the first of many cards I made using the Animal Expedition DSP #146902 and the coordinating Animal Outing #146597 stamp set from Stampin Up. This playful suite works perfectly for Valentines, Birthdays and any other occasion. Today’s card is purely magical. I was challenged by friend and customer, Mindi to make a slider card using the Fabulous Flamingo #143758 stamp set from Stampin Up and then teach her how to make it. Challenge taken and Achieved! I have always loved the look of the magic slider cards but never too the time on how to do them so I scoured You Tube and Google to see how to do them and it was not that bad. It took a lot of trial and error which was frustrating but I did not give up. The trickiest part is getting the track for the sliding mechanism to work but other than that it is not too bad. I have been celebrating my love of beautiful patterned paper all month long. Today’s card uses the now retired Whole Lotta Lovely DSP from Stampin Up. The sentiment and flower were stamped using the now retired coordinating Lots of Love stamp set. Todays card is one that I made using products that were intended for Christmas cards and made a baby girl card. This card features the background paper from the now retired Merry Little Christmas DSP. I added the sentiment from the retired Watercolor Christmas stamp set onto a Stitched Shapes #145372 piece . I added total cuteness with the Powder Pink Bitty Bow #144217. My friend loves all things Harry Potter so when she got pregnant I knew that I was going to buy her the Harry Potter onsies designed to wear each month so that you can see their growth over the course of the year. 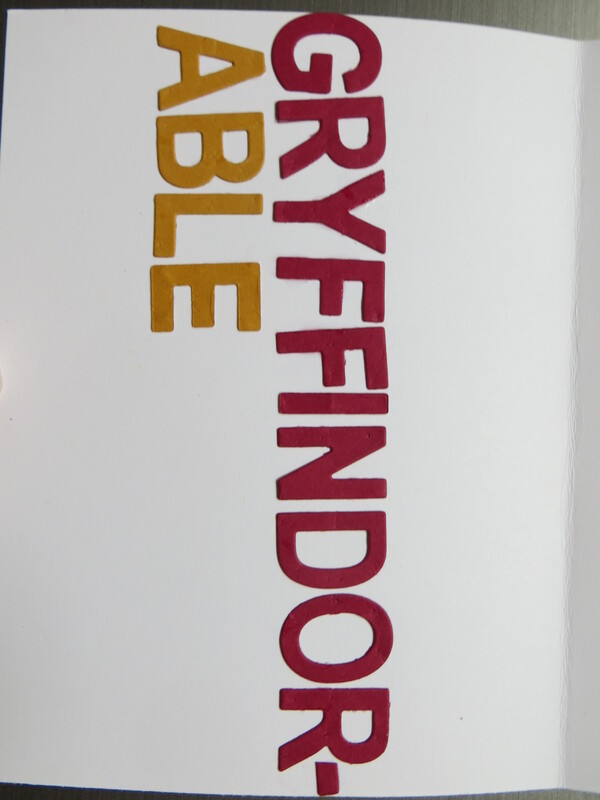 The gift was perfect too because she is having a boy and the theme of the nursery is Harry Potter. 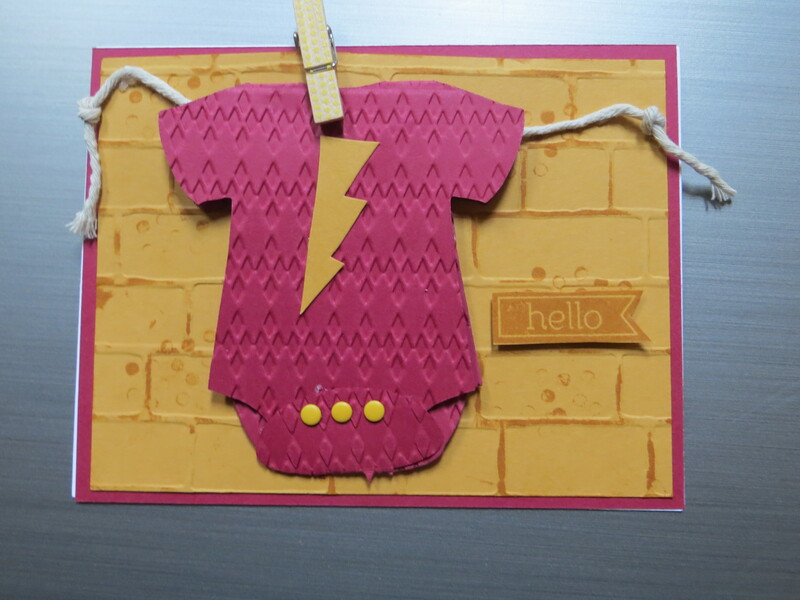 So to keep in theme with my gift, I made a baby card using a onesie die for a pattern I hand drew and cut out the lightning bolt. The onesie was attached to the clothes line with a mini paper clip. The background was textured using the Stampin Up Brick Wall TIEF #138288. I distressed the brick wall using the Gorgeous Grunge #130514stamp set. For the sentiment on the inside of the card, I cut the letters using the Little Letters Thinlits #133730 from Stampin Up to complete the themed card. 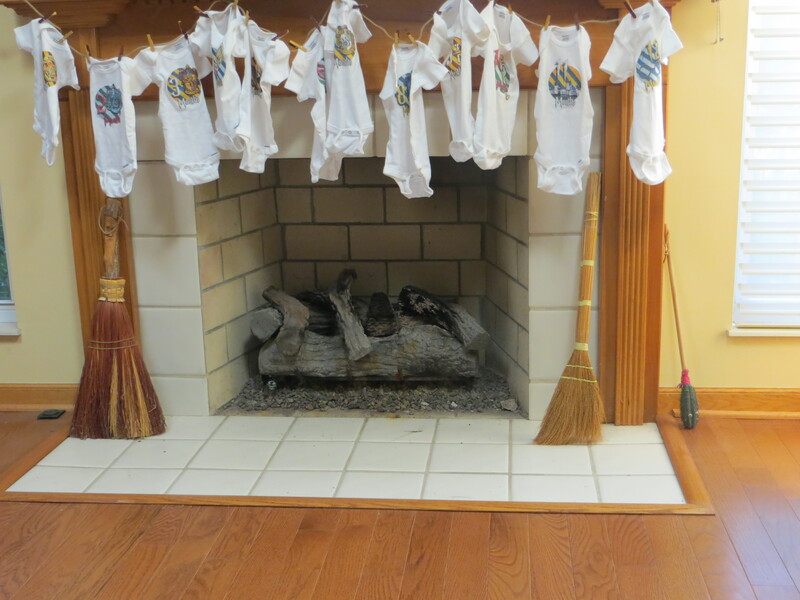 For the gift, I added the onsies on a piece to twine and attached each onesie with a mini clothespin to create a continues chain of Harry Potter onesies. 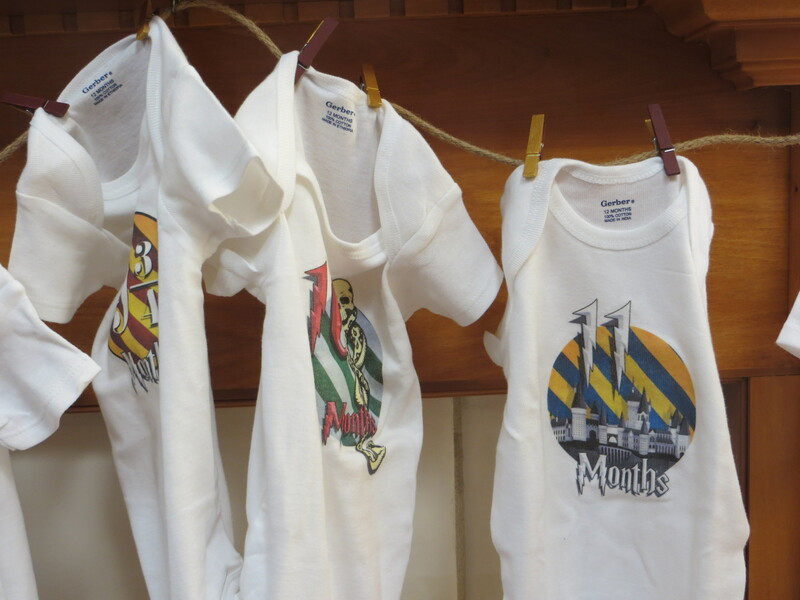 I have also added a close up of the super cute onesies. 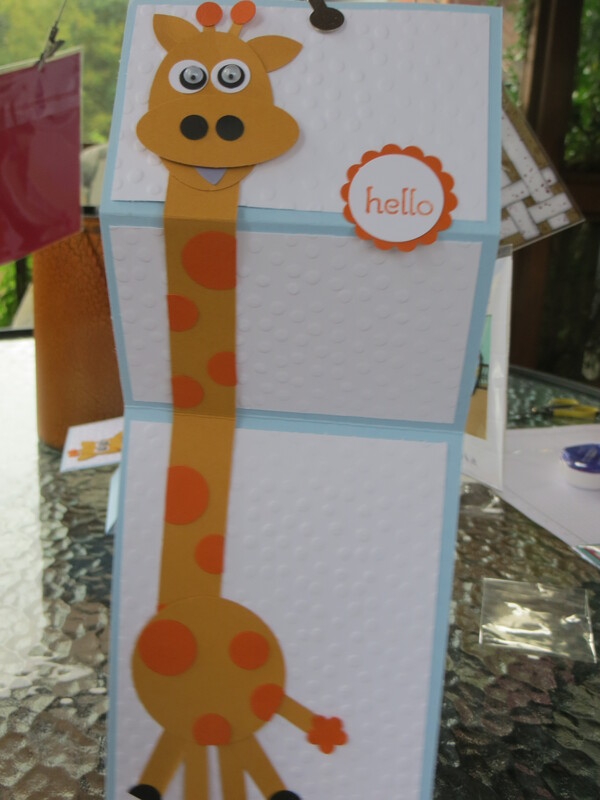 Todays post is the card I made for my sweet friend that became the grandmother of twin boys. 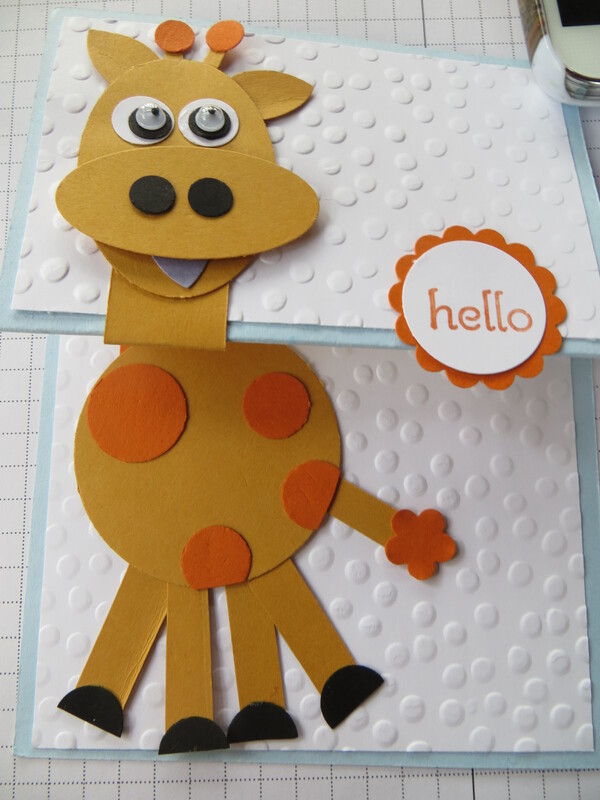 I love punch art and this one uses lots of different punches and pieces to make this cute giraffe with a super looooooooooooong neck!